1 Let’s begin by getting a pan and making it nice and hot over medium high heat. Pour some oil and throw in the onion and garlic and just sauté until the vegetables give off a nice aroma. Gently add the ground beef next and continue to sauté until you see that it’s lightly toasted. 2 Here’s where all the flavour will come from, just add the Knorr Kaldereta Recipe Mix dissolved in water and the liver spread. Give this a quick boil before simmering to thicken the sauce. 3 Stir in the cream next then toss with the cooked pasta and place in a baking dish. 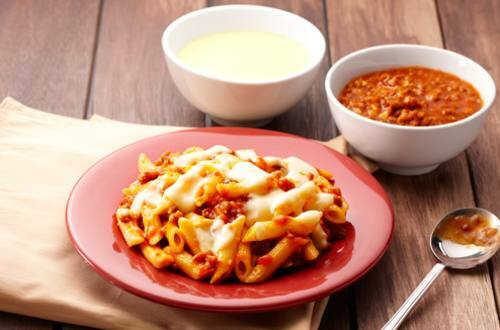 Sprinkle a generous serving of melting cheese on top then bake or toast until the cheese melts and that’s our dish! 4 Serve Tomato Crème Penne any day of the week and your family will adore you for it! They’ll be delighted both by the taste and by the knowledge that this pasta was uniquely made with actual Knorr Kaldereta Recipe Mix!